The way a jig performs depends not only on its weight, but on its head design, the type of dressing , and the hook style. Ball- This common, fast-sinking head works well in most situations. But the hook eye, which is on top, tends to catch weeds. Keel - Flattened vertically, this thin head slices through the water with litt1e resistance and sinks rapidly. It is ideal for fast cunent or deep water. Bullet - Another fast-sinking design, the bullet head cuts easily through cunent. Because it does not settle as rapidly as a keel head when jigged, it snags less and is usual ly more appealing to fish. Slider- A slider head is flattened horizontally, so it sinks slowly and glides through the water. 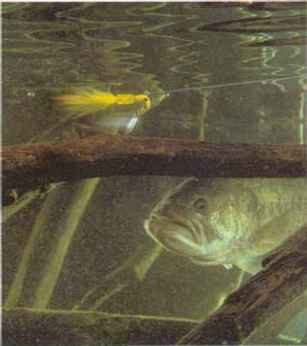 It is most effective in shallow water and for suspended fish. Mushroom - This head was designed for use with soft plastic tails. The plastic can be snugged up flush to the head, and a double barb on the collar keeps it from sliding back. This makes it a good choice for ripping through weeds. Banana - Because the hook eye is far forward on this head, the tail points up when you lower the lure and down when you raise it. The sharp kicking action makes this head ideal for vertical jigging. 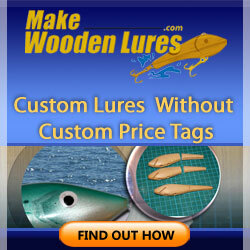 Stand-up - This head is designed so that the tail and hook stand up when the jig rests on bottom. The high-riding hook makes the jig fairly snag-resistant. Pyramid - The hook eye is at the front tip of the tapered head, so weeds tend to slide overthe head instead of catching on the eye. Other head styles - Some heads baye a lip which gives the jig a wiggling action. Others baye a spinner blade or propeller for extra flash and sound. DRESSING. The type of dressing affects the sink rate and action of a jig. Most jigs coTe with some stand-up; (8) pyramid; (9) lip style, or wiggler; (10) spinner style or pony; and (11) propeller style. Hair- Natura1 hair gives a jig an attractive pulsing action. And hair is durable, enabling you to catch Tany fish on the same jig. Bucktail hair works especially well. It holds its shape and its natural buoyancy slows the sink rate, making the action more tantalizing. Other popular types of hair include calf tail, squinel tail and rabbit. Feathers - Airy feathers such as marabou baye an enticing, breathing action unlike that of any other materia1. Stiffer feathers are used as tails or hackle collars. But feathers lack the durability of hair. Soft plastic - These dressings feellike real food, so a fish Tay mouth the jig longer before recognizing it as a fake. This extra instant improves your chances of setting the hook. 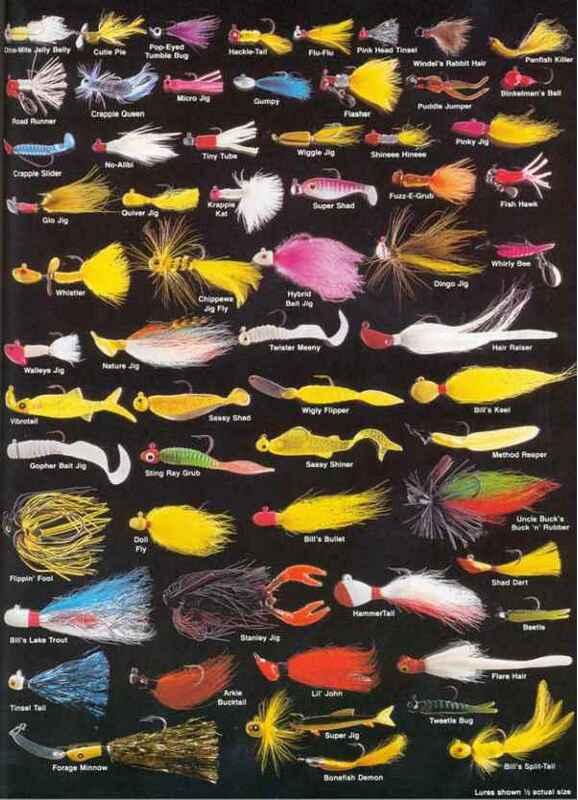 And like bucktail, soft plastic slows a jig's sink rate. Curly-tailed soft plastics wigg1e enticingly. 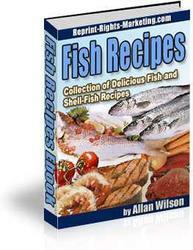 Other soft plastics irnitate natura1 foods like rninnows, crayfish and grubs. Soft plastic tails are less durable than most other dressings. They tear after catching a few fish, and a pike, muskie or walleye can easily bite them off. Other dressings - Tinsel and mylar tails are extremely durable and reflect light well. Live-rubber tails baye a billowing action, and their buoyancy causes the jig to sink slowly. Imitation-hair tails made of nylon or other synthetics are tough, but mat easily and lack the action of rea1 hair. Fishermen sometimes coTblne the regular jig dressings with pork rind trailers, rninnows or a wide variety of other live baits. HOOK STYLE. 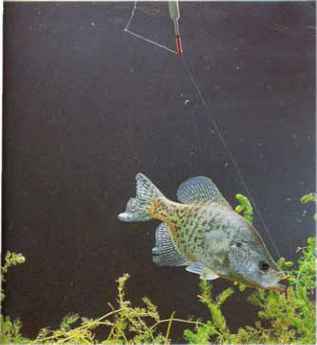 How well a hook penetrates and holds a fish and how easily it unsnags depends mainly on its thickness. Most jigs coTe with fine-wire Aberdeen hooks that penetrate easily. When snagged, they can often be straightened with a direct pull on the line. Heavier O'Shaughnessy-style hooks work better for tough-jawed fish and for horsing fish out of dense cover. Some hooks baye a brushguard made of nylon bris-t1es, a -shaped plastic strip or a piece of heavy mono. With the right jig and the right presentation, you can catch everything from quarter-pound sunfish to 40-pound lake trout. The most common way to fish a jig is to cast to a likely spot, then retrieve in short hops along bottom. Another effective method is to jig vertica11y in tight spots or while drifting with the wind or current. When fish are suspended, you can count your jig down to different depths until you find the most productive level. Yoh can also tro11 with jigs. Slow trolling along structure will take a wide variety of fish including wa11eyes, northern pike, and largemouth and sma11mouth bass. As you move along, twitch your rod tip to hop the jig over the bottom. Trolling steadily in mid-water will catch fish like white bass, stripers and crappies. When using this method, add a soft plastic curly-tai1 to your jig to improve its action. Many anglers believe jigs are effective only on a clean bottom because they snag easily in brush and foul in weeds. But a light jig works we 11 when hopped oye!" weed or brush tops. With a litt1e practice, you can keep it dancing inches above the cover. Catching fish on jigs requires a high level of concentration, a fine-tuned sense offeel and quick reflexes. If you fail to pay constant attention, if you are not accustomed to recognizing subtle strikes, or if you do not set the hook immediately, chances are you will go home with an empty stringer. Keep your line taut at a11 times, especia11y as the jig sinks. But the line should not be so tight that it interferes with the action of the jig. Stay alert for any twitch or sideways movement of the line. Watch your line carefully to make sure the jig sinks norma11y after the cast and when jigging. If it stops sinking unexpectedly, a fish has probably grabbed it.
. Set the hook at the slightest indication of a strike. Do not hesitate; a fish can pick up the jig and expel it in an instant. Always tie your jig directly to the line, without snaps, swivels or other connectors. A loop knot like the Duncan loop (page 12) will allow the jig to swing freely, maximizing its action. When fishing for northem pike, pickerel or muskies, attach a wire striker to your jig using a twist-melt connection or haywire twist (page 14). . Most serious jig fishermen carry a jig box stocked with a wide variety of heads and dressings for different species and situations. Often, a head weighing 1/8 ounce more or less than the one you are using can make a big difference. the rod tip slowly to keep the line taut. Keeping a taut line at this point is the key to success with this technique. Continue to hop the jig this way until you can no longer maintain contact with bottom. REEL a spinner-type jig steadily over logs or brush in shallow water. The resistance of the blade reduces the sink rate, so you can retrieve slowly without snagging. This technique is best for bass and crappies. TIP a plain, fluorescent-colored jighead with a minnow, leech or piece of nightcrawler when fish refuse to strike dressed jigs. 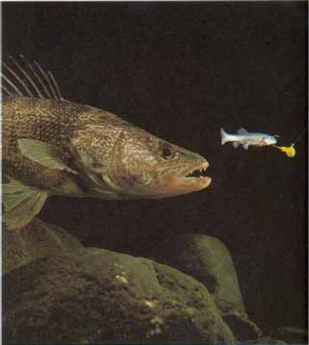 The fluorescent head draws attention from fish, and the plain hook will not hide the bait. HOP a stand-up jig over a snaggy bottom. 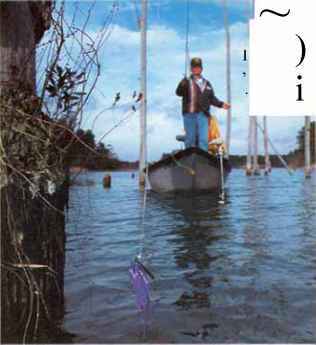 The hook seldom hangs up because the jig usually comes to rest with the tail pointing upward. 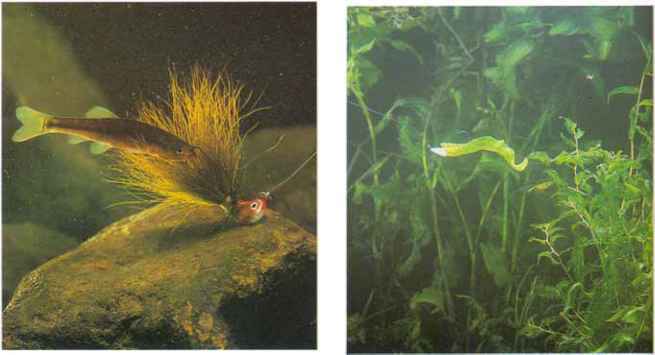 And the upright tail is easy for fish to see. SUSPEND a micro jig from a pencil float to fish over brush or weeds. Twitch the float so the jig rises, then sett1es back to the cover. Set the hook when the float tips up. 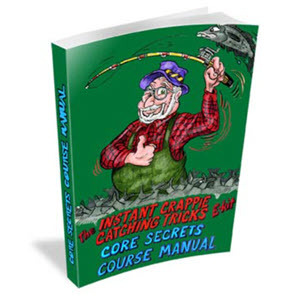 This method works especially well for crappies. FLIP a brushguard jig alongside a tree or into a tight pocket in weeds or brush. Flippin' enables you to fish targets quickly and accma~ely. A banana-head jig dressed with a pork strip is ideal for this technique. ANCHOR a soft plastic tail to the jig head to keep the tail from sliding back. Apply a drop of super glue to the collar, then push the tail forward. Let the glue dry before using the jig. MOLD your own jigs using tin rather than lead. A tin jig sinks more slowly than a lead jig of the same size and shape. And, the tin has a permanent shine that appeals to many gamefish. SHORTEN your jig tail to improve your hooking percentage when fish are striking short. A jig with a shortened tail appears smaller and often draws more strikes. body, from the bottom up. The point should come out just behind the head. Press the tail over the hook eye until the eye comes through. Thread on a (5) Sassy Shiner tm so that the hook protrudes between the dorsal fins. The fins help keep the hook from fou1ing, making the lure semi-weedless. Position a (6) paddle-tail grub with the flat part of the tail tumed horizonta11y. This way, the grub tail pumps up and down when you jig the lure. TIE a #10 or 12 treble hook, or stinger, to the bend of your jig hook to catch short-striking fish. Pierce the head of a minnow with the jig hook; the tail with one prong of the stinger. CHOOSE jigs with fine-wire hooks when fishing around flooded trees or stumps. Tbe hook will straighten enough 50 you can free it from a snag, and you can easily bend it back. BITE a piece from the tail of a soft plastic shad or shiner to improve its action. Reducing the thickness of the tail makes it more flexible, increasing the amount of side-to-side wigg1e. rod tip at the snag, then pull sharply with a long, sweeping enables you to exert a downstream tug which usua11y motion. Water resistance against the Belly of the line frees the jig. How to put a curly tail plastic on a bucktail jig? How to fish cotee jig heads? How to tie lure nylon to jig heads? How to fish a plain jig head? Which is better for jigging, lure or live bait? How effective are bucktail with artificial shad for trolling? How to tie jig using a rabbit strip? How to tie a jigging rap so it hangs forward? How to tie hooks to artifical bait? How to attach rabbit strip to a jig? How to use a ballhead jig? How to tie a rainbow tree lure? How to attach rainbow trout a lure? How to tie a trailer hook on rabbit strip? How to make shiner jig? How to tie a stinger hook on a jig head? What crappie jigs use rabbit strips to make them? How to make fishing lures from my rabbit hides? How to tie jigs lures?